What I am concerned to examine is the notion that any man who is a Christian can preach and should preach. There are some sections of the Christian Church who have taught this regularly. There has been the slogan, ‘Give the new convert something to do; send him out to preach and to give his testimony’ – and so on. There has been this tendency to thrust people out into preaching. Much of this can be attributed to the influence of Charles G. Finney and also D.L. Moody, who was very keen on that idea of giving the new converts something to do. One might wonder what the above quote by Dr. Martyn Lloyd-Jones has to do with a book titled, “Should She Preach?”, but I suggest that Dr. Lloyd-Jones’ concerns form, at root, the fundamental basis for Tony Miano’s thesis in his forthcoming book on whether women should preach the Gospel of Jesus Christ in the open air. Just what is preaching, and just who should preach? The question of “should she preach?” is an important question for me personally. In fact, Tony’s book is very timely as I have also been working through “should he preach?” most of 2013. While the latter question is not the topic of Tony’s new book, whether a woman should preach and what kind of man should preach are closely related. While I have only been preaching in the open air for 2.5 years, I have learned much about this biblical evangelism principle. But, I have made mistakes along the way, and I have seen its abuses. With noble intentions four years ago, I was swept into a movement that has revolutionized biblical evangelism in the public square. Though this movement has many successes in encouraging Christians to be more bold and faithful in taking the Gospel outside the four church walls, it is largely a movement detached from real local church ministry and commitment, a movement that uses pragmatic means to justify potential ends, and a movement that has birthed a pseudo-church evangelism community that really shouldn’t exist insomuch that it has cultivated an incomplete understanding and practice of the fellowship of the gospel. Please don’t misunderstand, there is a lot of good that has come out of the recent years’ street evangelism “explosion” (to borrow a phrase), but a lot of damage has been done as well. These concerns deserve needed constructive examination, but are not the point of this article. I only mention them to say that I recognize some issues in the “street evangelism community”, and some of the issues have impacted Tony Miano’s own experiences and why he was compelled to write, Should She Preach? So when I was asked to be a part of a peer review team for this project, I took on this responsibility with much enthusiasm as similar questions on preaching were already a part of my current study. Tony opens his thesis on whether women should open-air preach with deep, heart-felt compassion for the women who will likely read this book. This book is primarily for them – not to be a discouragement to them, but an encouragement to them to find their godly and biblical role as Christian women in evangelism. The introduction makes clear that Tony loves the women he has trained in the past, and this fact played a significant role in Tony’s reasoning to write his book. Tony also lays the groundwork for why his position has changed and makes a concerted effort to make clear his present conviction is derived from Scripture. Thus, his argumentation is grounded in God’s Word and not by deconstructing opposing viewpoints. No reader, whether male or female, will be able to walk away from this book with the attitude that Tony has an agenda against women, or that he is seeking to undermine what has become a relatively popular means to fulfill the Great Commission in recent years. What the reader will find by honest assessment is that Tony desires nothing more than to be faithful to God’s Word, and when Scripture changes his mind on something – whatever that something is – he is obligated as a Christian to conform his thinking and practice to Scripture. I am thankful for Tony’s transparency in this regard. He bears a Christ-exalting example of humble confession and changing one’s teaching and practice if found to be contrary to biblical commands and principles (biblical repentance). After building his thesis on the foundation of God’s created order for men and women, Tony makes an air-tight argument for why women should not open-air preach, using 1 Timothy 2:12 as a critical verse. This verse, and complimentary texts, instruct that women should not teach or exercise authority over men in the local church assembly or in a public setting, as doing so would be contrary to the woman’s natural, God-given role as a woman (gentle, quiet spirit; godly, humble submission; inward beauty, etc.). Tony also provides depth to his argument by taking a close look at the Greek word “kerusso” (which means – to preach), as well as addresses Scripture-based arguments often employed to make a defense for women in open-air preaching, including “the woman at the well” and the often-referred Great Commission passages of Matthew 28:18-20 and Mark 16:14-18. However, many churches, pastors, theologians, and evangelists who hold that a woman cannot preach in a pulpit, serve as an elder, or teach or disciple men in the context of the local assembly of believers are just as adamant that women can preach the gospel in the open air. I think the reason for this is simple, and yet profound. Many of the before-mentioned see open-air preaching in a certain way—an unbiblical way. But for the times when a church engages in an evangelistic “event,” (usually corporately on church property or in a public venue, such as a local park) the American Church, by and large, often errantly sees evangelism as a personal activity engaged by individual Christians. With such a mindset (a prevalent one at that), many American churches, pastors, theologians, and evangelists do not see open-air preaching as the work of the Church. Instead of seeing open-air preaching as a work of the Church, a healthily-functioning and necessary activity of the Body—the family of God; open-air preaching is seen an extra-curricular activity, away from the church. As such, women are wrongly taught or encouraged that they can assume their own authority to stand up and preach. Not even men should assume their own authority, circumventing God’s processes in the local church to affirm qualified men and send them out for this Gospel ministry, but Scripture gives no instruction nor makes any provision for women to fulfill these ministry shoes. 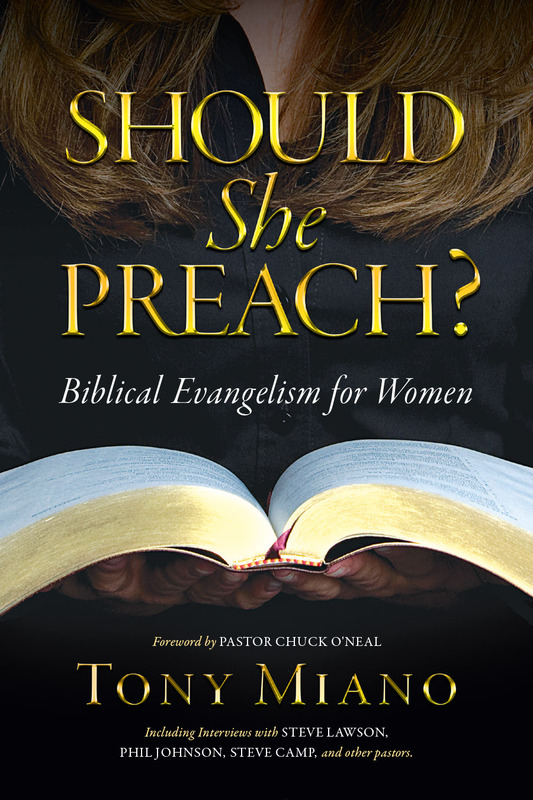 Tony does well to not only make a strong case for why women should not open-air preach (for the same reason they should not preach in a pulpit – this is thoroughly presented in the book), but he also does a fine job emphasizing the significant role women have in biblical evangelism. One of my favorite parts of the book was the story he shared about a Christian woman who ministered to a disheveled, perhaps even possessed, woman who had just been incarcerated. This Christian lady ministered to her in a way that only a godly woman could, and her tenderness and compassion in sharing the love of Christ and the Gospel led to the salvation of this otherwise hopeless person. No man could have witnessed to this woman in this way, and this is just one beautiful illustration of how God uses women to fulfill His Great Commission. As Tony explains, women have different roles than men. Women are not unequal in dignity, but rather function in different roles, and some roles only they can fulfill – to the glory of God! Tony’s hope, and mine, is that women will come to better understand (and enjoy!) their role in evangelism to see people come to saving faith, but they must first understand God’s predetermined (and good!) order in the Body of Christ. I am hopeful the intentions of this book will be met in the hearts of sincere students of God’s Word. Randall Easter – Senior pastor and evangelist of First Baptist Church of Briar, TX. These interviews will not only bring an increased curiosity to read Tony’s new book, but also provide greater credibility that Tony is rightly dividing God’s Word on this important topic. I am looking forward to reading the final copy of Should She Preach? It is one that will bring encouragement to the women who currently or have previously preached in the open air (whether at the abortion clinic or on the street corner), and hopefully it will help men and women rightly understand God’s Word and the role of women in biblical evangelism. Not only this, but I am also looking forward to the continued discussion on the role of men in open-air preaching as it relates to the local church. In my opinion, Tony’s new book may serve as a helpful catalyst for that needed conversation in the modern evangelical church. Should She Preach? Biblical Evangelism for Women can be pre-ordered at One Million Tracts, and a Kindle version will be released soon. Tony Miano can be followed on facebook and twitter, and you can listen to him live on Sunday nights on Cross Encounters Radio. Endnotes:  Lloyd-Jones, Martyn. Preachers and Preaching. London: Hodder and Stoughton Limited, 1971. Praise the LORD for Tony Miano’s thoughtful and Biblical book on women’s role in evangelism. There is much confusion in this area, and frankly I have “preached” on the streets due to the lack of a man being present. May God have mercy upon His people and lead us into all truth, including the proper roles for men and women who truly want to please and serve Him wholeheartedly. Thanks, Justin, for the review! My privilege, Friend. Sadly, that is a common argument used to support women preachers – “if more men would do it I wouldn’t have to!” True, we do need more men going forth to proclaim the Gospel in the streets, and we need more churches to equip these men for this ministry, but that does not mean women must or should fill those shoes. Women need to be concerned with how God has beautifully made them and how they honor Him in the unique roles they have been given, regardless of any perceived failures in the men around them. Thanks for sharing yiur thoughts and God bless! Women often give the example of Deborah as a reason to fill a man’s role. I really struggled (and sometimes still do!) with what my responsibility is as a Christian woman. I’ve been called to be a wife, mother and grandmother – so these should be my first priority and I can do these things to God’s glory. In the past I prided myself on “picking up the ball” if a man dropped it… Then after much study of the Scriptures, I realized that it wasn’t my place to “carry the ball” and if it dropped, then so be it; I can do more for the Kingdom in my God-given role as a woman than taking on roles clearly meant for men. Mr Edwards, I fully agree with what you said. We do need more men to step up and preach BUT according to Mr Miano preaching shouldn’t be done by everyone. He thinks only a few with the right qualifications should. Then i hear that more men should do it. Which one is it? Do it or not do it? Hypocrisy in the making. Hi Guillermo, there is no hypocrisy. I agree with Tony, as would Dr. Martin Lloyd-Jones per the quote at the beginning of the article, not everyone should preach. Everyone should be prepared to give a reason for the hope that is within them, but that is distinct from being a man called, qualified, and sent to do the most important ministry of the church through the preaching of the Gospel. The idea that any man (or woman for that matter) can assume their own authority to teach and preach outside the authority of the local church is foreign to Scripture, and it is foreign to orthodox Christian church history. Men were called, they were affirmed after their character, doctrine, and ability to teach were examined, and they were sent or supported to do this work. I recently just read the biographies of George Whitefield and David Brainerd – I think both of these books will help you better understand what I am saying (as well as “Preaching and Preachers” by MLJ). That we need more godly men to go forth in the streets is true, but it is not true that this should be done outside the covering and authority of the local church and the Gospel ministry given to it from Christ. …and I think Tony’s book goes a long way in explaining these unique and beautiful roles God has for His precious daughters. Thank you, Justin, for your review of the book. I am touched and humbled beyond words. I pray the Lord uses your review and commendation to draw many to read the book, for their edification, and for God’s glory. Amen, brother, my prayer as well. It was my privilege, and every word is true. Glad it encouraged you…the Lord is your Helper and your Strength! Thank you for sharing your commendation on Tony’s new book. I really enjoyed what you had to say and I look forward to reading this book as soon as it becomes available. Very welcome, Al…thank you for reading! The word of God does tell women they cannot preach, so I am in agreement with what God says. As for this book, one of the reasons I will not read this is because Mr. Miano has an unbiblical approach to sinners when he street preaches. He is rude and offensive; he belittles and insults the sinner, and he gives no Gospel presentation. You cannot expect an unregenerate sinner to side with you on abortion, their greatest need is the Gospel right? Unworthy1, suit yourself to not read the book, but taking one video and judging Tony’s entire ministry in how he engaged a single person is unfair, shortsighted, and quite frankly, is borderline slanderous. You were not there, and in whatever way Tony may have not responded perfectly, he did attempt to break in with the law, only to be met with mockery and a hardened heart. The hundreds of videos and articles Tony has published show your accusation to be false, not to mention my personal observation of his ministry face to face. I am sad to see you pass this kind of judgment against your brother. Just wanted to mention that I’ve listened to several of Tony Miano’s recordings of ministering at the abortion mills and I’ve never found any fault with his style or presentation of the Gospel. I think I am a credible Christian pro-lifer who spent approximately 10 years ministering at abortuaries; so my recommendation of Mr. Miano is valid. Also, to clarify my previous admission of actually “preaching” at an abortuary – it only happened one time – my usual partner – a Christian gentleman, wasn’t able to be there, so I admonished those going in to not kill their preborn babies. My usual practice was to hand out Gospel tracts and pro-life information to the women going in and to pray for them. Lyn, it’s obvious you nothing of Tony Miano. He’s one of the most faithful to the gospel street preachers the church has proclaiming abroad. I’ve seen him in person and have viewed and heard many evangelistic outreaches via youtube etc. And his is faithful to the gospel, not perfect like the rest of us. It’s the pelagian heretics that do the insulting, not Tony. Hopefully, you’ll be more careful in the future. I also think an apology from you would be the Christ like thing to do, while acknowledging your error. I watched the video Lyn is referring to and if one isn’t accustomed to the highly emotional and dramatic situation of street ministry at an abortion mill, then Mr. Miano’s rebuke of the young man will appear to be out of bounds. Frankly, perhaps both parties need time to reflect and pray. Witnessing to the ungodly who spit on and curse us sometimes takes a blunt approach in order to get their attention. Regarding the approach to sinners when street preaching or witnessing at an abortuary: I am a true believer that God gives us the grace and words needed when we’re standing at the very gates of hell which is the abortion mill. Frankly, I’ve been extremely blunt with some young men who were pressuring and/or forcing their girlfriends to abort. I spoke to them as I hope someone would speak to my sons if they were in process or contemplating the destruction of my grandchild. Then there are other times when a soft approach is needed and a person can be reasoned with more easily. We really have to trust God when witnessing because He knows the person’s heart and who has been planting Gospel seeds previously. If this young man were my son, I would want someone to speak to him as Mr. Miano did. My advice to Lyn is to spend some time in front of an abortion mill and see just what really goes on there. It’s a battleground and we need strong men preaching there. Oh, there are many, many more videos that you could view. Tony’s affiliation with Chuck O’Neal is also questionable, but let’s overlook all that an embrace him for the sake of a ‘book’ he wrote. No wonder Christianity in America is in a shambles, men follow men and uphold men, regardless of their actions. I am not surprised at all that you would defend Tony and accuse me, I expected nothing less…. Lyn, please take your slander somewhere else. Thank you. Hey Lyn, I read your testimony and praise the Lord for the work He is doing in and through you. I also did a little research into the things/people you mention and want to caution you to remain objective as there are always two sides to a story. Also, I visited Julie Ann’s blog (she is now following me on twitter) and found it to be full of anger, bitterness and just plain meanness. If you are associated with her – please be careful as she appears to be doing more harm than good. Please feel free to contact me through my blog if you want to talk. May the good LORD bless and keep you safe. I will follow Christ and Him alone – men will always follow and defend men, even when they behave in a manner that is less than Godly. May the young man in the video be blessed by God to hear the Gospel before his time on earth is done. Lyn, you are being foolish as I did watch the video, and what I meant by passing judgment on his entire ministry by using a single video to make your case. Further, you would be found foolish if you read his book and be met with the clear gospel presentation therein. Your comments are off topic to this article and are not helpful. I welcome your on topic comments, however. Well, to be fair, she did not say she only viewed “one” video. You are the one who mentioned that. And I agree with the Chuck O’Neal thing. He is certainly not one I would ever affiliate with. If I could get the book for free, I would read it. I wonder if Mr. Miano would consider providing a free e-book on his website? He seems to think it’s imperative to get his message out–this reversal in thinking regarding women and preaching. So much so that he is apologizing in public. A free e-book would be wonderful for the many who will not/cannot purchase his book. Diane, yours will be the last offtopic comment I allow regarding Pastor Chuck O’Neal. Tony is not obligated in any way to offer free books to anyone. But, he has already provided free giveaways of the book on his radio show. Maybe you can tune in to listen next week and win one of his gracious offers if he does as he did last night. Blessings. That is a great buy, Melanie. Thank you for posting. WELL worth the money, which we all realize goes toward actually publishing this (or any other) book: pastor interview transcription, manuscript editing, manuscript typesetting/formatting for paperback and Kindle, the donated copies to speakers and participants at conferences, etc. $10.98 is a serious bargain! Thanks, Justin. Just in case you are not aware, there is a league of false converts, led by women, who have engaged in a five-year vicious campaign against Pastor Chuck O’Neal and Beaverton Grace Bible Church. They are revilers and liars. I know Chuck O’Neal, his family, and his church family. I stand with them, beside them and, if necessary, in front of them against these attacks. It was/is an honor and privilege to have Pastor Chuck O’Neal write the foreword of my book. Thank you, Tony. I don’t really know much about the issues. The only thing I really know about Pastor Chuck is his humble foreword in your book, and the compassionate plea to sinners in the video you posted a few days ago. Perhaps if any of the folks making these accusations find their way to my blog, they would proceed to your recent defense of pastor Chuck on your blog, and leave their comments there. This is not the place for that conversation, however. This article is about a well-written argument for the biblical role of women in evangelism. Agreed, brother. And I have no plans of further derailing the derailed conversation, here. 🙂 Just wanted to provide some context to explain why folks are commenting here about Chuck O’Neal, with no real care regarding the issues/subject matter in the book. Glad you did, brother 🙂 – my remark was to those who would attempt to derail in the first place. Now I’m off to work and have turned on moderater approval…be back later today….blessings all! Of course he isn’t “obligated”–who mentioned that? A few free giveaways, although a kind thing to do, is not the same as making it available to all. I would imagine Mr. Miano thinks this book is that important, no? Freely- he was given the ability for the writing of this book from Jesus. Freely- he may wish to consider wanting to give back to those who cannot/will not purchase his book. That’s all. Thanks for letting me comment again. Diane, for those who “will not” by the book – that is their prerogative. I recommend you contacting every Christian book publisher with your same argument and see how many free books you end up with. For those “cannot” buy the book, perhaps they could get one of those free giveaways. Now please, I welcome you to make a comment regarding the article and the material presented, but these offtopic remarks are not helpful. FWIW – I am NOT affiliated with any movement against O’Neal AT ALL. I am aware of it, but not a part of it. My loyalty is only for One; He who sits at the right hand of the Father…. Thank you for your reply, Justin, I see your point. I would add that not every author that writes a book is announcing an important reversal in interpretation of scripture s/he once held, nor making a very public apology about the reversal. It is my opinion that such a person would do all that is physically possible to remedy the situation (out of concern for having taught so many so wrongly about women preaching). One venue available would be making a free e-book available on his blog…or, at the very least, keeping his 4 part series on Should She Preach up on his website. And my point was not to the Christian book publisher, but to the author. This will be my last — and thank you for letting me comment. I appreciate not being deleted. I wonder if you could go to your public library and request them to purchase a copy of the book? I have done that in the past and when they don’t have a copy of the book I’m wanting to read, they buy a copy, which I can sign out to read. Since this whole post and the book by Mr. Miano concern themselves with “street preaching” would someone be so kind as to cite the Scriptures that authorize such activity and the ones that would bring the same under the authority and control of the local church. Also, which church oversees Mr. Miano’s activities in this regard. Hi Darrel, the point of the post is not to defend the merits of the biblical evangelism principle of open-air preaching. But you will find plenty of examples in the New Testament, namely the Gospels and the book of Acts, as well as there being a strong precedent in church history. You might also appreciate Spurgeon on the topic: http://www.biblebelievers.com/StreetPreaching2.html, or taking a look at this post form The Cripplegate: http://thecripplegate.com/the-lost-art-of-street-preaching-must-it-be-resurrected/ Because of the nature of preaching, it is something that falls under the fundamental ministries of the church, and should not be done outside the covering of the local church (equipping, affirming, sending, etc.). But this is really a whole other topic than the main point in this post. Tony serves as an example of what biblical local church submission and commitment looks like. Since it’s public information, I’ll share that Tony belongs to Faith Community Church of Santa Clarita, CA. Hey, Darrel – For me personally (not that anyone cares), I don’t want a handful of scriptures – I want to read the book. It’s just like a Bible study – don’t need a bunch of scriptures….need to read THE BOOK/chapter/whatever (in context) to get the entire gist of the meaning/message. I also want to hear a justification for the position, which takes a “discussion”/book to get. Jehovah’s Witnesses and Mormons use scriptures and, sometimes, are able to give “halfway-good” arguments for what THEY believe. Sorry for butting-in, Justin. I enjoyed the artical brother. I had already planned to ready Tony’s book but if I had not this artical would have given me the desire and curiosity to do so. God bless you brother. Thank you, brother Mike. Really looking forward to our fellowship at The Herald Society in a few weeks! I am hearing concerns about Tony’s position that women should use caution when witnessing to men. I hear it in such a way that women fear they are being silenced. However, I was more impacted by Tony giving caution to men witnessing to women than women witnessing to men in his soon-to-be-released book “Should She Preach?” It actually lifted a burden from me to view each witnessing opportunity with a woman as to how or even if I should engage her, depending on the context of the situation. My first priority is my marriage and to protect it against even appearances of evil. I also have my personal integrity and ministry to protect. If I cannot witness to a woman without potentially compromising these elements, then I need to reconsider and trust the Lord to provide someone else to witness to the woman. Tony gives helpful examples and points on this issue, and he is far from leaving this burden on women to be cautious. I left this chapter feeling his admonition was directed more heavily toward men, and the Lord used it to heavily admonish and edify me personally. I’m curious, if men should not evangelize women and if women should not evangelize women, than how will women hear the gospel? Hi Katy, I never said what you suggested in your question. Women can hear the Gospel from men and women in different contexts and methods. The point is that, especially for married people, we should be discerning as to whether a particular witnessing encounter is appropriate, and trust the sovereign grace of God to draw His sheep to Himself if we determine not to share the Gospel with a particular person due to potential negative impact on our Christian witness. Hope that helps, and thanks for your question. Are You Obedient to the Great Commission?